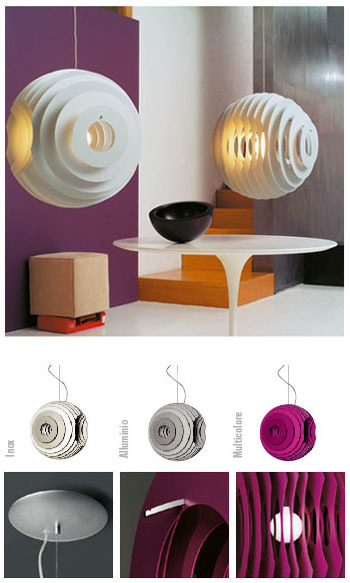 Designed by Italian architect Ferruccio Laviani for Foscarini of Italy, the Supernova pendant provides a 360-degree range of ambient illumination. The fixture consists of 14 circular aluminum or steel disks that form a louvered sphere measuring 23 3/4 inches high and 22 1/2 inches wide. Available in matte aluminum or muli lacquered pink. The pendant hangs from the ceiling with thin aluminum aircraft cable and uses one 150-watt incandescent bulb. It is perfect for both residential and commercial projects.